Newly remodeled townhome with granite kitchen, new maple cabinets, genuine hardwood floors, slate entry, and marble bath. Our open living area features vaulted wood-beam ceilings, a wood-burning fireplace for the wintertime, a gas BBQ on the balcony for the summertime, and a large TV (with Roku, for use with our Netflix account or your streaming account only -- no cable) for relaxation after a hard day's play. For those who do not want to get away from it all, we have wi-fi. We cater to those who appreciate a nice home-away-from-home, care for our home as we do, and become repeat renters. 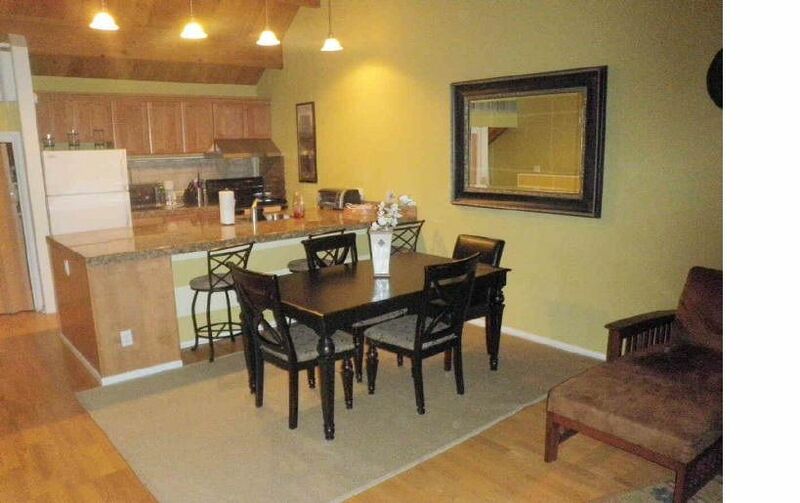 This cozy two-bedroom, 1 bath townhome is perfect for the vacationing family, romantic couple, or small group. The main bedroom features a queen bed, TV, and balcony. The second bedroom has two twin beds and a trundle. The couch in the living area converts to a king bed. This kid-friendly home comes with toys, games, children's books, and videos. Renters will have access to the clubhouse, which boasts a swimming pool (open from Memorial Day through summer's end), large hot tub (open all year), showers, and two saunas (his and hers). Other clubhouse amenities include a pool table, ping pong, tennis courts, BBQ and picnic area, and children's playground. Nestled among tall pines and bordered by granite boulders, we are located in Lake Village, about one mile from the casinos and the Gondola to Heavenly Ski Resort, 1/4 mile from the award-winning Edgewood golf course, and 2 miles from the beach. A short walk leads to the forest that's perfect for cross-country skiing in the winter and a trail for hiking and biking in the summer. We are a family of five who love to travel. We ultimately chose to buy our second home at South Lake Tahoe because of its beauty and tranquility. We love to play hard during the winter and summer months, and come to relax during the spring and fall. As often as we visit Lake Tahoe, it never gets old! Lake Village is conveniently located 1/2 mile from the Edgewood Golf Course, less than one mile from the casinos and the Heavenly Gondola, and about 2 miles from the beach. It is seconds away from all the action, yet set enough away for peace and relaxation. Lake Village offers all the amenities -- pool, hot-tub, saunas, tennis courts, children's playground, BBQ's, billiards, ping-pong. For our three young children who love to swim, the pool is their oasis. For my husband and I, the his/hers saunas and hot-tub are a big plus. Lake Village is truly a vacation destination. Available trundle can be joined with twin bed to create a King bed; kid friendly with children's toys, books, and videos. The mattresses in both bedrooms could be replaced along with all the pillows. Very clean and cozy. Location was great and convenient to everything. The property was exactly as listed. Having a key code shared with us prior to arriving was key, since we had weather issues and arrived late. The condo has the amenities that were promised. The community hot tub was a drive away, which wasn't ideal, but hey, we had access to a hot tub, which we used frequently. The property was a quick drive to South Lake Tahoe and Heavenly. The road of the complex were plowed quickly, which was necessary as 5 feet of snow fell in our 4 nights there. All in all, it was exactly what we expected. Nice clean home and a very good location in South Tahoe. Spent a weekend at this home with my family and we had an amazing time. The house was well kept, comfy, and in a great location. Very nice and clean! Family friendly! Loved it, if you have kids you'll love it too. The condo was as described. Very comfortable and clean and quiet. We walked 2.3 miles to Nevada State Beach for lake fun through a wooded and secluded paved pathway from the condo. It is hot in August at Tahoe. The downstairs bedrooms stay cool all day and evening and the owner provided fans for upstairs. We wood book again.